Not enough has been written about the rhums of Dillon, a rum-maker in central Martinique whose origins stretch back many centuries and at the time when I was in Paris in 2016 I not unnaturally went for one of the better ones available (recommended by the estimable Jerry Gitany, who hosted me for a very pleasant three hour session in Christian de Montaguère’s shop, while the Little Caner concealed his boredom upstairs). I tried it twice, once there, and once at home and can confirm that it’s quite an interesting rhum. Dillon traces its history way back to 1690 when the site of the distillery in Fort de France was settled by Arthur Dillon, a soldier with Lafayette’s troops in the US War of Independence. A colonel at the age of sixteen, he married a well-to-do widow and used her funds to purchase the estate, which produced sugar until switching over to rhum in the 19th century. The original sugar mill and plant was wiped out in the 1902 volcanic eruption, and eventually a distillery went into operation in 1928, by which time there had been several changes in ownership. In 1967 Bordeaux Badinet (now Bardinet / La Martiniquaise Group) took over, the mill closed and the original Corliss steam engine and the creole column still was sent up the road to Depaz…so nowadays Dillon has its cane, but the distillation and bottling is done by Depaz, which is owned by the same group. Dave Russell of Rum Gallery, who actually visited the distillery, remarked that the creole single column still is still in operation and is used specifically to make the Dillon marque, perhaps in an effort to distinguish it from Depaz’s own rhums which, by the way, are also quite good. 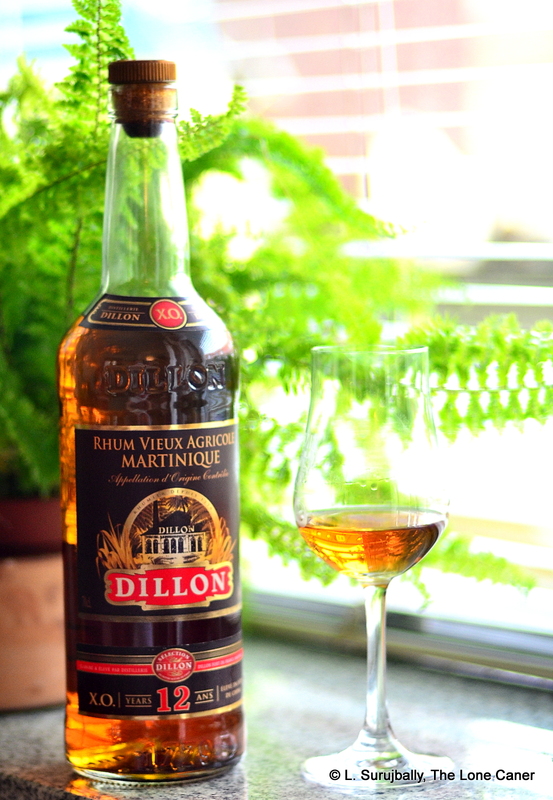 AOC compliant, the Dillon XO was made from cane juice fermented for two to three days and then run through the creole still, and bottled at 45% ABV. Dark gold in hue, it presented itself well on the nose, showing off a peculiar divergence from the more forceful grassy, herbal smells we commonly associate with agricole rhums. It began with sweet caramel and honey notes (not what I expected, though I liked quite a bit), heated but not sharp, progressing desultorily to a lighter profile redolent of flowers – lavender, perhaps – ripe mangoes, a hint of acetone and vague lemon peel. It was almost delicate in its way, and what grassiness there was, was kept way back – in fact, that honey smell remained quite distinct throughout, though fortunately not overbearing. The palate was also somewhat at right angles to the standard, though the underlying DNA was quite clearly in evidence. This will sound strange, but what I tasted after the delicately sweet lemongrass, honey and pancakes, was something smoky and more muscular, salty, even beefy. Flowers again, some cereals, anise, vanilla, nuts, white watery fruits (guavas and pears), peaches and apricots, and some citrus held way, way back. Actually, I thought it was a shade too sweet, and even on the short and delicate finish (more lemongrass, peaches and indistinct vanilla and honey), this feeling persisted. So, a bit on the odd side, yet still a very nice agricole, and I should remark on the fact that there was almost no oakiness to be sensed at all throughout the entire tasting session.